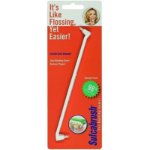 Effectively cleans gingival sulcus and other hard-to-reach maintenance concerns. Two-row ultra-soft bristles for gentle brushing. Tapered head recommended for sulcular brushing.